What does your voice sound like? 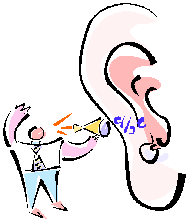 Did you know that the sounds you hear when you speak are not the same as the one people hear? The voice you hear has the vibrations through bone in your skull added in – obviously people hear the sound of your voice without that added extra! What sort of voice you have been given? the throbbing drone of a Mongolian throat singer? the squeak of Mickey and Minnie Mouse ? the annoying whine of a chain saw? or the delicious memorable Liam Neeson? There are always ways to polish the technical aspects of vocal performance – ‘vocal’ doesn’t always mean singing. Articulation – how crisp are the ends of your words? How rounded is your mouth when you are delivering your words? Projection – can your words be heard past the front row? Breathing – can you finish the sentence or phrase in one breath? Volume – loudness does not equal projection – the difference is in how much you involve your diaphragm! Forward placing – the sound is placed in the front of the mouth – not droning in the throat or squeezing out through the nose! The final point I want you to note, dear reader, is that if you don’t welcome the sound of your voice no-one else will either! Here are some tips to help you love your voice! Make a recording for yourself of your voice – reading something. Discover what you like and congratulate yourself. Decide what could be improved and take a look at the list above and see whether any of those aspects are relevant. Take action to address whatever the issues are. This is purely the technical aspects of speaking, of course, we are not addressing any of the fear factors here. That will be covered in another post.